White House press secretary Sarah Huckabee is facing demands she resign on Thursday after her “Orwellian” attempt to alter reality by sharing a clearly doctored video of the incident that the Trump administration used to justify suspending CNN reporter Jim Acosta. In the video, which had first been posted by Paul Joseph Watson of the far-right website Infowars, Acosta appeared to slam the side of his hand down on the woman’s arm in a “karate chop” move as she attempted to take a microphone away from him. Critics quickly noted that the video had clearly been edited, speeding up Acosta’s movement as well as removing his verbal apology to the intern to make it look like he intentionally hit her—instead of trying to keep the microphone and continue asking President Donald Trump a question. Rafael Shimunov, a video editor who has worked with the Working Families Party, was among those who posted a side-by-side comparison of the original video with the one the White House shared. 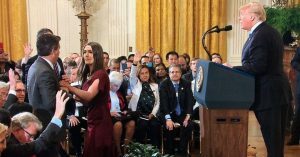 The video was shared to bolster the administration’s claim that Acosta deserved to be stripped of his press credentials following the press conference. Some denounced the White House’s attempt to capitalize on a cultural and political moment in which women’s allegations of abuse have been taken seriously—even as Trump himself stands accused by nearly two dozen women of sexual assault and harassment and has openly bragged about such behavior, while also denying the allegations and attacking his accusers. Huckabee Sanders defended the White House’s decision to share the apparently doctored video. Umm, no. The intern made contact (without consent) numerous times. @Acosta never initiated contact. You need to resign, for making serious false accusations. It’s not the first time the Trump administration has used propaganda videos to further its own agenda. Last year, Trump angered the British government by retweeting three videos allegedly showing violence by Muslims—including one of which was found to be fake and actually show a young non-Muslim Dutch man perpetrating violence and another which was from an unverified source. Like Wednesday’s, the videos had also originally been posted by a far-right source—a leader of the anti-immigrant political party Britain First.